“Cuban Elbow” is not the kind of photograph that immediately catches the eye. The saturated colors so often splashed across contemporary images of Cuban life are not found here. There are no pastels coating once grand architecture, no couples dancing son in glittering fatigues, nor trumpeters silhouetted against a dusky Malecón sky. It is simply an elbow alone. It is nondescript, sepia, sinewy. An elbow dappled in sunlight, striped in shadow. 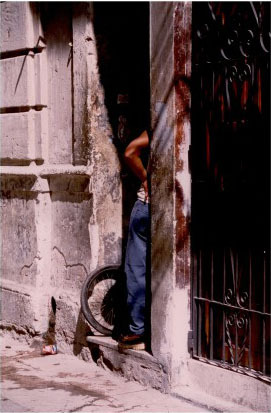 An elbow poised in the doorway, protruding slightly into the street. It is a stripped-down aesthetic reminiscent of Tomás Gutiérrez Alea’s 1968 cinematic masterpiece, Memories of Underdevelopment, subtle and intimate in its austere umbra. It is set in a moment of stillness, of repose. The afternoon lull draws the viewer in, as if we too have traced Rachel Tanur’s footsteps down an anonymous Cuban side street, and invites us rest in the shade. Tanur’s photograph suggests metaphor, but a metaphor of what? Metaphor has long weighed heavy on the Cuban body. After the Revolution was won, Che Guevara declared that “to build communism, a new man must be created simultaneously with the material base” (1965). The Cuban body was to become the literal anatomy of communist revolution. But instead of a whole, the elbow alone is presented here, disconnected, an isolated limb on an isolated island. Does this left elbow belong to the new man? We cannot see his face. He wears a thin t-shirt, loose jeans, and work boots that suggest the universal drudgery of labor. But as he leans arm akimbo against a well-worn wall—the material base of his country—we do not actually know whether he does so in weariness or in leisure. However, when Tanur snapped “Cuban Elbow,” there was reason to be weary. Cuba was still in its Special Period, a time of widespread poverty that crippled the country at the end of the last century, a century that was supposed to be promised to the communist man. What other dreams once rested upon that elbow? Maybe, when he was younger—like so many other Cuban youths—this man fantasized about becoming a professional baseball player. Maybe he was a southpaw, a lefty, or “zurdo” in Spanish, not to be confused with “izquierdista,” a leftist. A baseball player’s elbow is paradox in Cuba. Most elbows give up after a while, get worn out, and with them the dreams of making it off the island. But in the rare instance that one’s elbow holds up, throws a no-hitter or two, becomes an arm that makes Cuba proud, it inevitably won’t stay in Cuba much longer. That golden elbow will follow the likes of Yasiel Puig or Yoeis Céspedes and, at its apex of national heroism, becomes a defector. A man’s elbow holds a great weight in Cuba. It is an island within an island. It is an elbow alone. Distanced by politics and economic embargo, the American consciousness has forgotten just how close Cuba is. As US-Cuba relations warm, “seeing the authentic Cuba before it disappears” has become a mantra of American tourism. Cuba’s peoples and landscapes become rapidly fading backdrops to American narratives of capitalism as both homogenizing and capable of salvaging the last of a “real” Cuba. Instead, the ubiquitous pictures of rusted vintage cars only evoke the actual distance of the photographer from the lived reality of most Cubans. It is a duality of the picturesque and not pictured, the liminality between the photographed street and private struggle behind closed doors. Tanur does not fall into this trap. She does not attempt the impossible task of capturing the entirety of Cuban spirit or constructing the bodies of her subjects as national monolith. “Cuban Elbow” is not about what might be lost but rather about what can potentially be found right around the next corner, if only one is patient and receptive enough. Tanur focuses on the fragments presented to her, and in doing so finds a link to the whole.